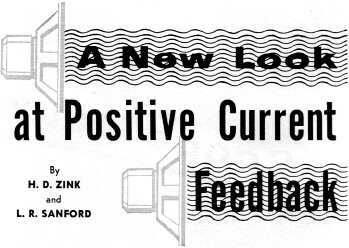 "The term, positive current feedback, is disturbing to some because, as is well known, positive feedback increases the distortion of an amplifier to which it is applied. This is true in this application also, but it must be noted that the net feedback applied to the amplifier is never positive but simply less negative in the region where the positive current feedback is effective." Wow, that is a lot like what politicians refer to a 'baseline budgeting.' When one political party says it is going to 'cut the budget,' while the other complains that doing so will 'starve children' and 'hurt women,' what it really means is that spending will not be increased this time as much as what had originally been planned, although it will actually be higher than the last time. We know the government never actually spends less money one year than it did the year before, but there are a lot of 'low information' people who never suspect a thing - just keep the welfare checks and food stamps flowing. Tests show that positive current feedback improves hi-fi systems which already have good loudspeakers providing the correct feedback circuit is employed. The use of current feedback to provide improved bass response in a high-fidelity speaker system has caused a lot of discussion pro and con. It has been argued that it cannot greatly improve speaker damping because the mechanical parts of the speaker are not coupled closely enough to the electrical parts.1 It has also been argued that it might help on an inadequate speaker system but that it was worse than useless on a truly high-fidelity speaker.2 On the other side, curves have been presented which give dramatic proof of the improved damping obtained with a particular kind of current feedback,3 but few details are given about the speaker system used and, therefore, no adequate conclusions can be drawn. This difference of opinion is understandable since the most desirable mode of loudspeaker operation for the best listening is not agreed upon even by experts in the field. The only way an individual can determine for himself the merits of such feedback is by the use of his ears. Listening tests in commercial demonstration rooms are not necessarily conclusive for two reasons; (1) many of the current feedback circuits are so arranged that a common ground between the amplifier input and a speaker lead destroys the feedback network and common grounds are frequently used in demonstration rooms, (2) many amplifiers provide only for negative current feedback which can only decrease the damping on a speaker and thereby accentuate its undesirable characteristics. Therefore, opinions formed by a brief listening test in a demonstration room may not be valid about current feedback. The question in the minds of the authors was whether positive current feedback (that which increases speaker damping) could add anything to a truly high-fidelity system which already had good speakers. 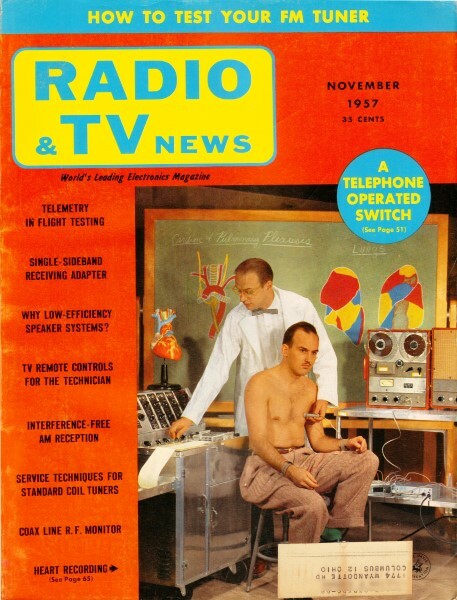 The results of tests showed the answer to be conclusively yes, if the correct kind of feedback circuit were used. However, the feedback configuration most suitable was different from those heretofore used and for best results different speaker enclosures required somewhat different configurations. What is actually accomplished with current feedback can be best understood by forgetting the ideas of damping, negative impedance, etc. for the moment and concentrating only on the frequency response. Anyone who has heard an audio oscillator through any speaker system has probably observed that while the response may be poor below a certain frequency, frequencies much lower than this can usually be reproduced if the power to the speaker at these frequencies is increased relative to the higher frequencies. Often, when this is done, appreciable harmonic distortion is present and the speaker cone rattles. Usually for music system use, if the bass output from the speaker is increased by conventional bass-boosting techniques, then such distortions are objectionable. In the optimum use of positive current feedback these objections to low-frequency boosting are overcome by using a rising bass characteristic as part of the feedback network. This compensates for the loss of low-frequency acoustic output without the harmful effect noted, since the positive current feedback keeps the speaker cone under control and, thereby, significantly reduces the distortion which would otherwise result. In some cases, the frequency below which no acoustic output at all is obtained is actually lowered. Fig. 1. 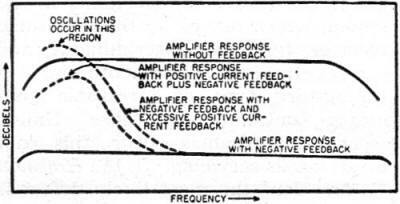 Effect of positive current feedback on the frequency response of amplifier. 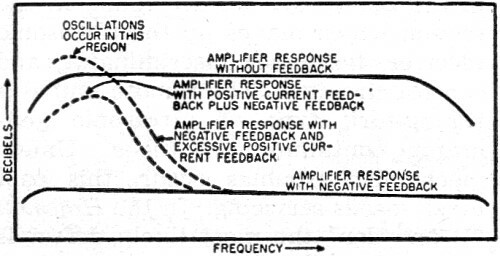 The term, positive current feedback, is disturbing to some because, as is well known, positive feedback increases the distortion of an amplifier to which it is applied. This is true in this application also, but it must be noted that the net feedback applied to the amplifier is never positive but simply less negative in the region where the positive current feedback is effective. See Fig. 1. The slight increase in distortion, which results from the decrease in the amount of negative feedback applied in the bass region, is more than offset by the decrease in speaker distortion in the same region. In the high-frequency region, where amplifier distortion is more disturbing, no positive feedback is applied and the amplifier characteristics remain unchanged. The important point to note is that positive current feedback applied to the amplifier is effectively negative feedback as far as the speaker cone is concerned. This point is not obvious, so the following experiment will be described to suggest why this is actually the case. Arrange a speaker, battery, multi-range ammeter, and a switch as shown in Fig. 2. With the switch on the "A" contacts so that the battery is out of the circuit, push the speaker cone in the minus direction and note the direction of the current generated by the movement of the voice coil through the speaker field. Assume this current flows in the direction of the arrow I. Now connect the battery through the "B" contacts so that the current which it causes to flow is also in the direction of the arrow, and note the direction in which the speaker cone moves. It is found that the speaker cone moves in the plus direction, that is, in the opposite direction from which it was moved in the first case. The current which acts on the speaker results in a plus motion of the cone whereas a minus motion of the cone produces the same direction of current when the cone reacts on the circuit. This means that when the cone oscillates after a driving signal has ceased, the current generated by the erroneous motion can be fed back through the amplifier to produce a driving current which will be in the same direction as the error current and that this current will drive the cone in the opposite direction. The net effect will be that the cone moves very little after the original driving force ceases. It can thus be seen that in order for the forces on the cone to cancel out (negative feedback) the error signal must be fed back without a change of phase (positive feedback). Fig. 2. Experimental setup that is used to determine how positive feedback works. When these facts are realized, the correct application of positive current feedback to any speaker system then becomes merely a matter of cut and try until the right boost characteristic is found. Since no electrical measurements can indicate the total effect, the final results must be reached by listening tests. The correct results are achieved when the speaker has a deeper bass than it has ever reproduced before - without any trace of boominess. A very good test is when low-level, low-frequency bass notes, such as the light tap of a tympani, bass drum, or soft organ pedal, are clearly evident without being boomy or muffled. An excellent demonstration of the effect of positive current feedback was given when the low-frequency response of a Klipschorn was extended from 27 cps to below 20 cps with a clean fundamental response. The difference in reproduction of a complex 16 cps organ tone before and after was quite impressive and easily noticed even by the untrained ear. The block diagram of the current feedback network used by the authors is shown in Fig. 3A. The essential difference between this circuit and similar ones used on commercial amplifiers is that no provision is made for negative current feedback, and an LC circuit is used in the frequency discriminating section of the feedback network instead of a single capacitor. 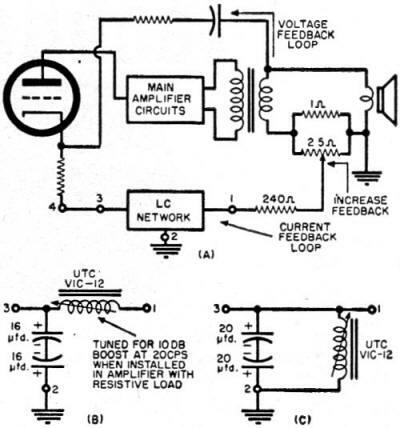 It is necessary to use an LC circuit because the single capacitor gives too much bass boost in a region where no boost is needed when used with some speaker systems (especially the Klipschorn and "Rebel" series). This results in an unpleasant over-accentuated bass sound and is probably the reason some have rejected the use of current feedback with high-quality speakers. The 25-ohm potentiometer shunted across the 1-ohm resistor provides a means of varying the feedback from zero to full positive. Its use, except tor comparison purposes, is questionable since usually full positive feedback is the most desirable condition. It could be omitted with no harmful effects in which case the 240-ohm resistor is tied to the ungrounded end of the 1-ohm resistor. Fig. 3. (A) Location of positive current feedback network. (B) shows Klipschorn network. (C) shows Rebel 4 LC network. The amount of feedback and therefore the degree of bass boost may be varied in several ways aside from the use of the potentiometer. The principal way is by changing the value of the 1-ohm resistor. It will be noted that a dividing network is formed between the speaker impedance and the current feedback resistor, such that if the speaker is high impedance (16 ohms) less feedback voltage will be developed across the resistor than if the speaker impedance is low (4 ohms). That is, for a given resistor more bass boost would be obtained when feeding a 4-ohm speaker than when feeding a 16-ohm speaker. The 1-ohm resistor has been found satisfactory when used with a speaker system having a net impedance of 4 ohms and, therefore, in some instances a 4-ohm resistor might be desirable for a 16-ohm speaker system. The amount of feedback and, therefore, the amount of boost can also be changed by changing the "Q" of the circuit elements used in the feedback network. The values called for usually require electrolytic capacitors and if these units are leaky or are used singly instead of in series pairs back-to-back, then less feedback will be obtained than would be expected. 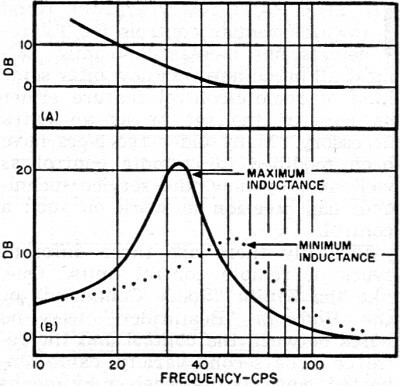 If the inductor used is variable, its "Q" will vary as it is tuned and this will also change the feedback. It should be noted that since the resistance in series with the speaker absorbs power it represents a loss in peak output, therefore, it is desirable to keep it as small as possible while still obtaining the required feedback voltage. Since high "Q" elements in the feedback network represent more voltage feedback than do low "Q" ones, they are to be preferred unless they give a boost characteristic that rises too sharply. This is an unlikely occurrence. It should be noted that the characteristics of the network, when not connected in the feedback loop, are not a good indication of the overall amplifier response when the network is in the loop since a "Q" multiplication effect is obtained and the amplifier response is sharper than the network response. To determine the constants of the LC network shown in Fig. 3A, procure an audio oscillator or frequency test record whose range is slightly lower than the lowest range of interest and listen to the performance of the speaker system using a conventional negative feedback amplifier. Note: (1) the frequency at which the bass response just begins to roll off and (2) the frequency at which no more acoustic output is obtained irrespective of how much power is used to drive the speaker. An LC network having a low-pass or bandpass filter configuration is then designed so that the upper turnover frequency occurs slightly above the frequency at which the response starts to roll off and the peak response occurs slightly below the frequency at which no output is normally heard. (The hypothetical termination resistance necessary for calculating the filter sections can be assumed to be about 600 ohms since it has been found experimentally that this value gives networks that are satisfactory.) This network will serve as a starting point and by varying the parameters while listening to the system using an audio oscillator or tone record the best sounding arrangement can be determined. For those not technically able to perform such calculations, the networks to be discussed will give moderately good results on any speaker system and will serve as a starting point for more experimentation. It is not advisable to use music for the first tests since low-frequency tones occur rather infrequently and are of rather short duration so it is difficult to notice the effect of circuit changes. The specific LC circuit configuration used with a Klipschorn is shown in Fig. 3B. This type of enclosure normally falls off below 27 cps so the feedback network is designed to become effective in this region and to provide 10 db of boost at 20 cps as measured across a resistive load. The response curve of the amplifier, when this circuit is used, is shown in Fig. 4A. It must be remembered that this curve was taken with a 16-ohm resistive load substituted for the speaker and does not necessarily represent the actual boost curve obtained with the speaker connected. In this case, sufficient feedback is obtained from a 1-ohm resistor even though the speaker is 16 ohms. Listening tests with an audio oscillator indicate that this amplifier-speaker system appears to be acoustically flat to below 20 cps. Fig. 4. (A) Amplifier response with networks shown in Fig. 3B and (B) Fig. 3C. Fig. 3C shows the network found best for use with the Klipsch "Rebel 4" enclosure. In the specific case considered here a G-E A1-400 speaker is used in the "Rebel 4," but the same circuit is also used on a "Rebel 4" with a much cheaper speaker and gives excellent results. The configuration is different from that used with the Klipschorn because more boost is required and it was found that a network that gave a steadily rising bass characteristic, such as used with the Klipschorn, caused the amplifier to motorboat when the feedback was increased to the correct point. This was because, when enough positive feedback was provided in the required region, all of the negative feedback was cancelled out at some lower frequency and the net amplifier feedback became positive in this region and caused the oscillation (see Fig. 1). This condition is avoided with the configuration shown since it is arranged to peak at the lowest usable frequency and then fall off below this point so that the amplifier has almost full negative feedback in the critical motorboating frequency range. This configuration also largely eliminates thumps that occur when tuning through FM stations. Curves obtainable with this configuration are shown in Fig. 4B and it must be noted that these curves also were taken with a resistive load in place of the speaker. The solid curve was found most suitable in this case and the low-frequency response of the "Rebel 4" enclosure with the G-E A1-400 speaker was extended from 40 cps to slightly below 30 cps. It seemed as if several slight peaks in the response were also eliminated. An attempt has been made to explain positive current feedback from a different viewpoint than is normally used and it is hoped that this article will clear up some of the controversy surrounding the subject. Three high-fidelity systems have been in use for almost one year with the networks described and at no time have any unpleasant results been observed nor has any listening fatigue been felt. Using these circuits on the Klipschorn and "Rebel" series enclosures gives a life-like bass that is only equaled by the most elaborate systems that are available.